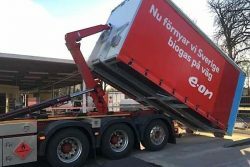 The Calvera Group, a Spanish high-pressure-gas storage solutions company based in Épila in Aragon, has delivered its first biomethane transport module to E.ON Biofor Sweden, one of the leading Swedish biogas suppliers. This transportable refueling infrastructure is well suited to the many remote locations in Sweden where pipeline gas does not reach. This is the first time Calvera Group has brought its technology to Sweden. This “easy-lift” equipment will be used to supply renewable gas to automobiles and heavy vehicles in the 70 gas stations that it has distributed throughout the country and augment what Rafael Calvera, general director of Calvera says is one of the best networks of biogas service stations in Europe. “We have worked closely with E.ON and other suppliers to design a reliable system which can transport gas more effectively via virtual gas pipelines on Sweden’s network of rural roads. In particular we have tried to simplify delivery by offering lighter modules which can be lifted rapidly on and off the supply truck via a hydraulic hook-lift crane. We think it will make a positive impact to the country’s network in the years ahead,” he continued. Each unit mounted on a truck will transport up to 4,300 kg. of biomethane (renewable natural gas), enough to refuel at least 40 buses. They are designed and built in the manufacturing plant that Calvera Group has in Épila, near Zaragoza. The Spanish firm is participating in discussions with other owners of biogas networks throughout Europe for possible entry into new markets.